Influenced by his guitar-playing father's record collection, which consisted of the likes of Led Zeppelin, The Eagles, Cream, and Carlos Santana, Jamie Humphries picked up the guitar at age 5, started jamming with friends, and played his first gig at age 10. In his teen years, Humphries was drawn to the sounds of more technically oriented artists like Eddie Van Halen, Joe Satriani, and Steve Vai, and soon dedicated himself fully to guitar playing. Before long, he hooked up with Total Accuracy, for whom he's written several book/CDs in their "Jam With ..." series. 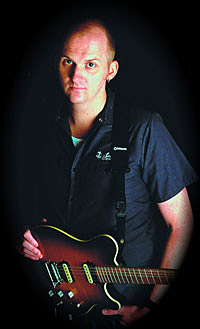 Humphries is also a regular contributor to the U.K.'s Guitar Techniques magazine and earned a teaching position at the Academy of Contemporary Music in Surrey, England. To learn more, visit JamieHumphries.com.